All of the strips listed below are examples of their kind - there are many others but there is little purpose in detailing all of them. You might expect an internationally syndicated cartoon strip to be published the same way everywhere. Any features specific to the country of origin, that may be unfamiliar to readers elsewhere, would surely be accepted as part of the strip's character. And whilst this is mainly true with Bristow, there are some fascinating examples of local editing to make references more relevant or understandable. These changes are not made consistently and, based on the differences in handwriting, were done at the receiving end and not by Frank Dickens. Sydney Morning Herald numbering: Strips in the GET and the MA (with a few exceptions) carry the original numbers. The SMH erased the numbers (that were written onto the original artwork by Frank Dickens) and substituted a month and day signifier. A few strips in the 1990s bear both the original number and the date - maybe the person doing the erasing got bored. , even further behind on 11/11/83, did the same thing. The difference in style in the altered date is clear. In strip 6561 (ES 20/12/83) there is a reference to the Christmas dinner and dance. The GET published on 29/12/83 and did not change the text but the SMH version, on 11/01/84, omits "Christmas".
) but is changed to "Smiths" in the GET. Why? St Mary's is a fictional school. What is the meaning of "Smiths Mixed Infants" to a Glaswegian reader? In 6586 a reference to a commercial product well known in the UK, Snowpake, is changed to "Correcting fluid" in the SMH. In 7179 a reference to the (real) London tube station Turnpike Road was changed to the (real) Glasgow station Byres Road in the GET version. In 7121 (March 1986) this goes further. The SMH (and presumably the ES) lists Crouch End, Holloway Road and Islington. The GET has Hyndland, Partick and Charing Cross. These are all real stations. In strip 3907 the word "Jankers" in the ES is also used in the MA but changed to "Pack drill" for the SMH. in 7743 (August 1988) Jones sings "Old Father Thames keeps rolling along". My source here is the MA which did not, thankfully, substitute Old Father Yarra. In 6416b (May 1983 Bank Holiday (and therefore not actually published in the ES), a runner is seen bearing a T-shirt inscribed "London Marathon". 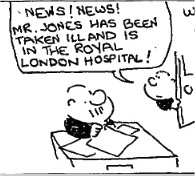 In a sequence 8353-55 Jones is taken ill and treated in the Royal London Hospital. Yes, a real hospital, not the East Winchley Cottage Hospital as one might expect. In 1490 (November 1965) Fudge gives Jones what Bristow describes as a "Wall to wall carpeting". The SMH, misunderstanding the whole point of the joke, substituted "reprimanding". Note to Antipodean readers "a carpeting" means a strict telling off, or reprimand if you will, and wall to wall carpets in the 1960s were the sign of a prosperous household who could afford full size carpets instead of rugs.
. Dickens has alluded to the difficulties he had with the truculent, overpaid and heavily unionised production staff at the paper. If he upset them by a direct reference to a strike, he risked the strip being "blacked", i.e. not appearing in the paper. At this time management had little control over the shop floor. Bill Bryson has similar comments about his time in Fleet Street in his lovely book "Notes from a Small Island". The GET, and perhaps other provincial papers, had been carrying colour versions for some time but the first one in the ES was this one in November 1999. This is an exact repeat of 2577 published in March 1969 - sadly there were a lot of repeats around this time, masquerading as originals. Over 14,000 cartoon strips there are bound to be a few duds. But there are some strips that are, in my opinion, so unfunny that I cannot understand how any cartoon editor could consider them for publication. In addition there are several recurring themes, particularly in the 1980s and 1990s, based on depicting Bristow as moronic, totally unable to cope with office life, and either in a coma or in a deep depression and on the edge of suicide. I don't find any of these themes particularly amusing. Furthermore the repetition of the basic "jokes" was so blatant that it was though Dickens was desperate to have someone tell him that Bristow was no longer to be published. Strip 8691a was published in the Evening Standard in May 1992. This scan is from the Sydney Morning Herald June 1992. Does not look like like Dickens drew it. Strip 6549a was published in the Evening Standard in December 1983. This scan is from the Sydney Morning Herald January 1984. 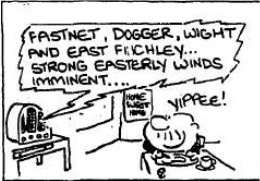 Strip 6551 was published in the Evening Standard in December 1983. This scan is from the Sydney Morning Herald December 1983. Strip 7563 was published in the Evening Standard in December 1987. This scan is from the Glasgow Evening Times December 1987. Strip 7596 was published in the Evening Standard in January 1988. This scan is from the Glasgow Evening Times February 1988. Strip 7942 was published in the Evening Standard in June 1989 This scan is from the Sydney Morning Herald July 1989. Strip 7486 was published in the Evening Standard in August 1987. This scan is from the Glasgow Evening Times September 1987. Strip 7725 was published in the Evening Standard in July 1988. This scan is from the Glasgow Evening Times August 1988. Strip 9061 was published in the Evening Standard in November 1993. This scan is from the Sydney Morning Herald December 1993. Strip 8686a was published in the Evening Standard in May 1992. This scan is from the Sydney Morning Herald June 1992. Strip 8739 was published in the Evening Standard in July 1992. This scan is from the Sydney Morning Herald August 1992. Strip 8774 was published in the Evening Standard in September 1992. This scan is from the Sydney Morning Herald October 1992. 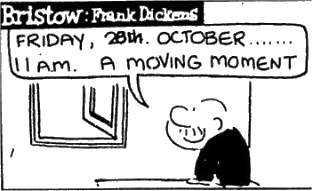 Strip 6290 was published in the Evening Standard in November 1982. This scan is from the Sydney Morning Herald December 1982. Strip 8609a was published in the Evening Standard in January 1992. This scan is from the Sydney Morning Herald February 1992. 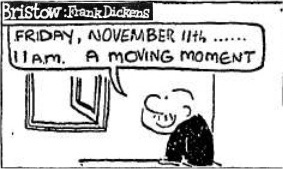 Strip 8611 was published in the Evening Standard in January 1992. This scan is from the Sydney Morning Herald March 1992. Strip 8619 was published in the Evening Standard in February 1992. This scan is from the Sydney Morning Herald March 1992. In the early years Bristow was ambitious, determined to get ahead of his fellow clerks, known as the man in touch with all the office gossip, always with a witty comment or clever put-down. The change in character is not in keeping; fortunately the tone improved considerably in the late 1990s and thence on FrankDickens.com. There are a few examples of syndicated strips that defy belief - clearly redrawn by people who couldn't draw, did not know anything about Bristow or indeed anything about cartoons. I surmise that something went wrong with the transmission of the pictures so somebody dictated the text over the phone and the night porter, or some inebriated subeditor drew a cartoon at the other end. 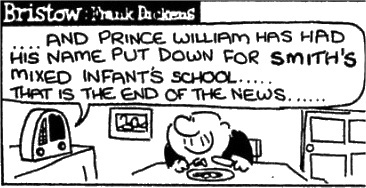 Strip 6061 was published in the Evening Standard in December 1981. This is a scan from microfiche. 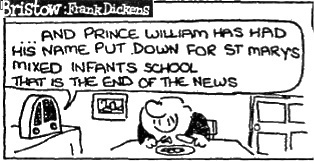 Strip 6061 was published in the Evening Standard on 30 December 1981. This scan is from a version drawn by someone else in the Glasgow Evening Times published the same day. in GET on same day but with a different number (GET did sometimes change the numbers when they followed a different sequence. Strip 7753 was published in the Evening Standard in September 1988. This scan is from the Glasgow Evening Times September 1988.
is not only drawn appallingly badly but the speech bubble in the first frame is pointing to the wrong speaker! And whoever drew this has never seen Fudge. 7765a was published in the Evening Standard in September 1988. This scan is from the Sydney Morning Herald October 1988.
has a "signature" but it is not Dickens' own (unless he was not in full possession of all faculties when he drew it). Strip 8691b was published in the Evening Standard in May 1992. This scan is from the Sydney Morning Herald June 1992. Strip 8717 was published in the Evening Standard in June 1992. This scan is from the Sydney Morning Herald July 1992.
have identical text. Both were published in SMH, the second within a month of the first, (and by implication in the ES as well) Did Dickens drawn them both? It doesn't look like it. Even the signatures vary.